We get asked all the time about another version of the Stimplus Pro called the Model SW-103F (Diff Amp.) We’ve heard all sorts of claims that this model is somehow special, different, or more effective. It also costs over twice as much as the version we sell. All Stimplus Pro models are made at the same factory, by the same company. This company has informed us that the electrical circuitry is identical, and the only difference is the sticker on the outside of the device. As you can see from the above tests, at minimum settings, output for both versions peaks at 0.2 Volts, and at maximum settings, output peaks just above 10 Volts. Pulse width, duty cycle and decay rate are statistically identical. In other words, the electrical output is EXACTLY THE SAME for both units. Same manufacturer, same factory, same circuitry, same design, same output. Different sticker. Stimplus Pro SW-103F? Don’t get ripped off! 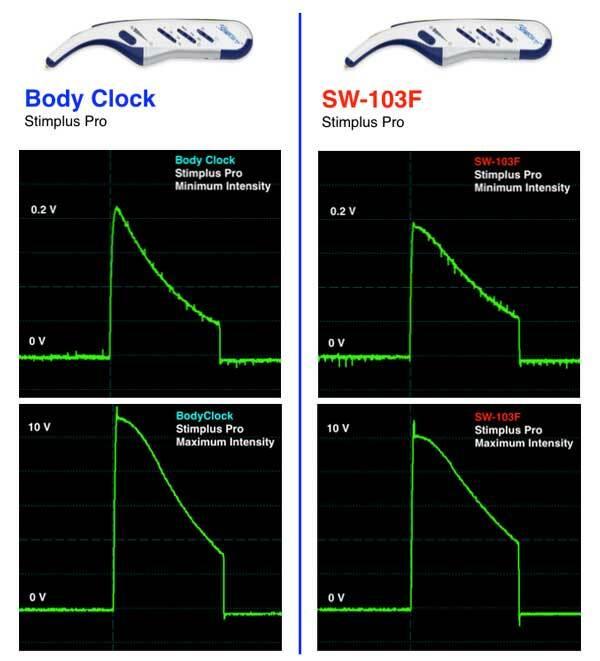 Our Body Clock Stimplus Pro devices are BRAND NEW, FIRST QUALITY goods. We do not sell refurbished equipment. Not now, not ever. All our Stimplus Pro units are individually serial numbered on the back for tracking and warranty purposes. Should you ever need warranty help, you’ll get first-rate service. Our Stimplus Pro units are FDA 510K Registered Medical Devices, cleared by the FDA and fully compliant with applicable U.S. laws and regulations. Click Here to Verify. We don’t make dubious claims we cannot back up, nor do we need to trash other vendors to sell our equipment. We simply offer the best equipment at a fair price. just to sell you the same equipment at double the price? So, what's so special about the SW-103F? Still want to spend $500+ for a Stimplus Pro model number SW-103F? Customer service is our number one priority. Give us a call and we will be happy to serve you. In fact, at that price, we will send you 2!